Please look at our item # R-032-AMK-F for full details of refill supplies. 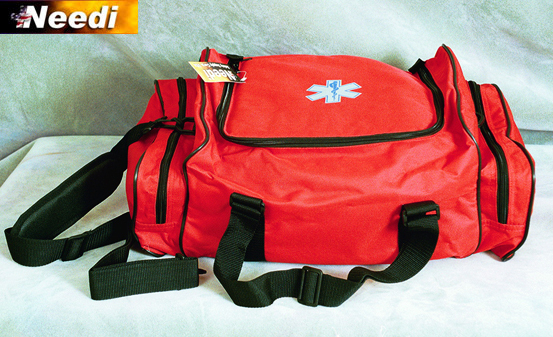 Hands free on scene Back Pack Trauma kit made of 600 denier cordura nylon with heavy PVC coating. The fabric is water proof and fire ressistant with life time warranty. Embroidered start of life logo in front of the bag with zippered flap. 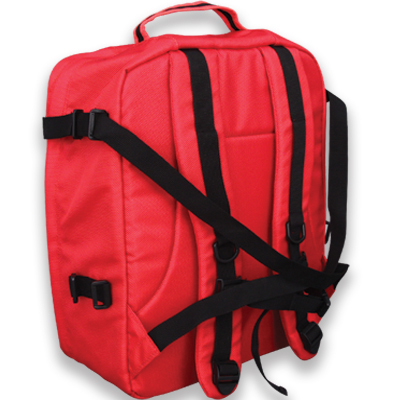 Back side of the bag has heavy padding for support with two padded shoulder straps. 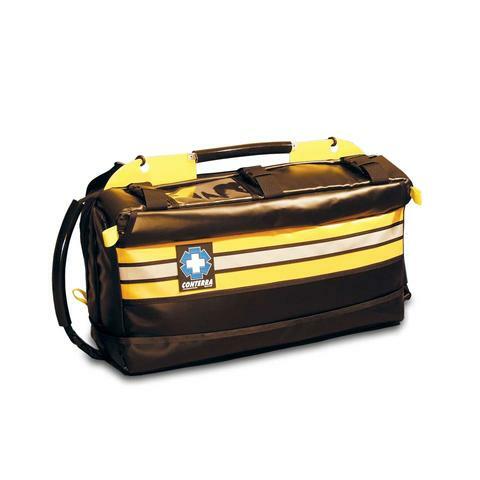 Comes with several mesh pockets inside the bag and 6 velcro removable compartments for quick and easy access to medical supplies. Size: 20" X 15" X 7" This Kit consists of: 1 Adult Bag Valve mask with reservoir and tubing , 6 nitrile latex free gloves, 10 4"x4" gauze sponges, 1 Bite Stick, 20 2"x2" gauze sponges, 1 mylar emergency blanket, 1 instant cold pack, 1 instant heat pack, 1 roll of coflex- med flexible hand tear bandage, 5 4" conforming stretch roll gauze, 5 3" sterile conforming stretch gauze roll, 5 2" sterile conforming stretch gauze roll, 1 pair of Truama Shears 7 1/2", 1 4" elastic bandage, 1 2" elastic bandage, 1 Needi Jumbo Triangular Bandage 40" with two safety pins, 5 5"x9" abdominal pads, 5 8x10 abd pads, 1 OPA KIT (set of 6 pcs), 1 Needi BP Cuff adult, 1 dual head sprague stethoscope latex free ,20 anti septic hand wipes, 1 Finger ring cutter, 1 Kelly hemostat 5.5" straight, 1 Needi Diposable penlight with pupil gauge, 1 roll of 1" clear adhesive tape, 1 face mask with eye shield, 5 knuckle flexible bandages, 16 1"x3" plastic adhesive bandage strips, 1 Trauma dressing 10"x30" sterile, 10 2"x3 (xlarge) plastic adhesive strips, 100 alcohol preps ,1 Pocket Mask Ventilator in hard case & 5 medium sized red bio haz bags. Critical Response Kit $ 299.00 It is a sad fact in our modern world that bad people harm the innocent. It is also a fact that the victims of mass shootings, terrorist bombings and other violent incidents (both human and natural) predominately die from blood loss. Many times the victims could have been saved in the first few minutes ( before Medics arrive) by life saving interventions. Unfortunately, most consumer grade �First Aid� kits are woefully inadequate to save lives in situations like this. 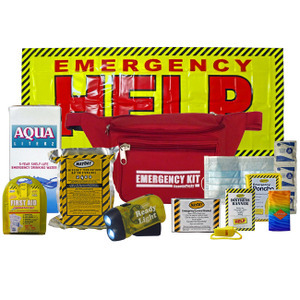 Our Critical Response kit has been designed to make life saving interventions possible for the survivors of violent acts, or disasters in the time that it takes for professional help to arrive. 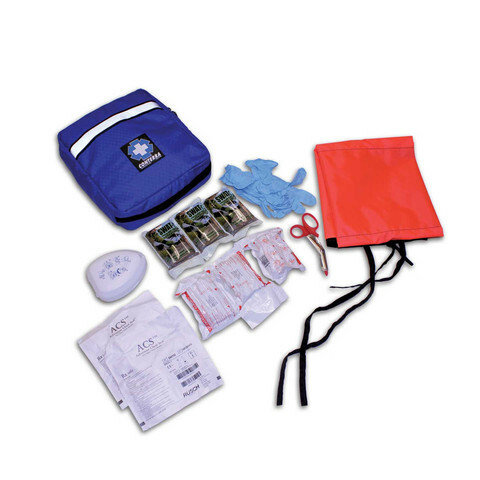 The Critical Response kit lays open to instantly reveal life saving equipment in clearly labeled spots. Unlike most mass produced consumer first aid kits, the gear inside the CRK is real battle proven professional life saving equipment. The equipment has been carefully chosen to be easy to use by non professional caregivers and professionals alike. For instance, the SWAT tourniquets are intuitive,and can serve multiple purposes. The kit also includes Israeli style battle dressings, Chest seals, CPR mask, gloves, and EMT shears. Another unique item in the CRK, is the HELP SIGNAL, an 18� x 36� Safety orange and black banner with the words � Help, Wounded Here� emblazoned in contrasting letters. When the scene is secured, the banner can be hung from a door or window or tied to an object to direct EMS medics to the wounded�s location, saving even more time in situations such as school shootings. This kit should be in every classroom, mall shop, and public building, in case the unthinkable happens. Comes with all supplies and an aluminium wall hanger. We also offer an instructional DVD for workers, teachers and employees on the use of the CRK. 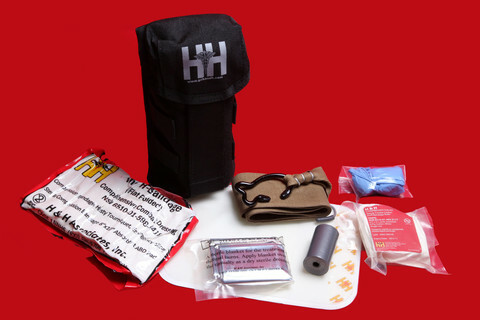 Emergency First Aid kit made of codura nylon. Easily ties around the waste and goes every where with you! Comes with following supplies. Size: 11.5"x5"x6" 1 1/2" X5 yards tape, 1 blood stopper, 2 5"x9" abd pads, 10 3"x3" gauze pads, 2 8"x10" abd pads, 1 Elastic bandage 3" x5 yards, 1 Eye wash solution 4 oz, 1 Lister Bandage Scissor 5.5", 16 1"x3" adhesive strips, 16 Knuckle bandages, 8 finger tip bandages, 10 alcohol wipes, 4 Nitrile latex free gloves, 10 antiseptic towelettes, 2 cold pack, 1 Needi Jumbo Triangular Bandage, 1 Elastic Rolled gauze 3" 1 Elastic Rolled gauze 4"
This kits consists of the following items 1 Needi CPR mask with hard case and glove, 1 Airway kit, 1 Burn Sheet 58x90 yellow, 16 adhesive bandages latex free, 2 abd pads 5x9 , 1 trauma dressing 12x30", 20 sterile dressings 4"x4", 10 sterile dressings 3"x3", 2 blood stoppers, 2 gauze rolls sterile 3", 2 gauze rolls sterile 4", 1 waterproof tape 1/2", 1 waterproof tape 1", 1 Elastic Bandage 3", 1 Elatic Bandage 4", 2 Triangular Bandages 40", 4 eye pads large, 1 petroleum gauze 3"x9", 2 Kerlix (4 1/2"), 1 Needi large trauma bag, 1 blood pressure kit , 10 alcohol wipes, 1pk of (10/pk) antibiotic cream, 1 sting swabs 10/pk, 2 cold packs,1 40z eye wash, 10 pvp Iodine wipes, 1 kelly forcep str 5.5", 1 Emt Shears 7 1/2" stainless steel, 1 bandage scissors 5.5", 1 splinter forcep 4.5", 1 Disposable Penlight, 1 Space silver blanket, 1 No Rinse Purell Gel 4 0z, & 5 Nitrile Latex free gloves. Please look at our items # 14-8803-EMK-F for complete listing of refill supplies for this kit. 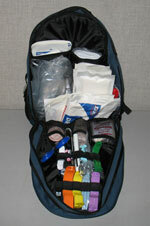 EMS Prep CPR kits . 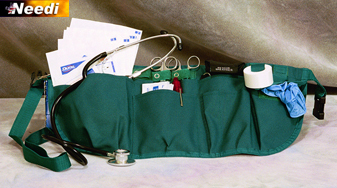 Ties around the waist with hands free, with 2pairs of latex free nitrile gloves large, 1 cloth silk tape 1"x10yards,1 reusable penlight, 1 lister bandage scissor 5.5", 1 kelly forcpe 5.5" straight, 1 CPR mouth to mouth barrier with shiled & nylon pouch, 5 4x4 sterile pads, 5 2x2 sterile pads, 1 firstaid tube 1 oz, 1 2x6" burn free Gel,1 dual head single tube 22" latex free stethoscope, 5 alcohol prep pads. 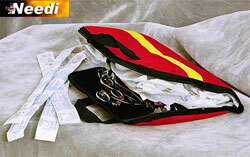 Plastic Wall Hanging 50 person First Aid Kit. First Responder/Trauma Kit has star of life flip top lid. three extra large removable compartments with heavy duty lock quick release buckles.This bag also conveniently ties around your waist. Size: 11"x7"x7" Kit Consists of the following items: 1 Pair of Emt Shears 7 1/2", 6 pair of Nitrile latex free vinyl powder free gloves, 16 1"x3" Adhesive Bandage strips, 10 2"x3" XL Plastic Bandage Strips, 10 Knuckle Bandage strips, 10 BZK Antibiotic Cleaning wipes, 10 alcohol Wipes, 1 Bite Stick, 1 cpr mask with shield, 1 ice cold pack, 1 2" elastic bandage, 2 cohesive flexible bandages, 5 Bio hazard bags, 10 Packets of Antibiotic Ointment, 10 Sterile 2"x2" gauze pads, 10 Sterile 4"x4" gauze pads, 5 Sterile 5"x9" ABD pads, 1 sterile 10"x8" ABD pads, 1 extra large trauma dressing, 1 Sterile 10"x30" abd pad, 5 X large Eye pads, 1 Needi Jumbo Triangular Bandage 40" with two safety pins, 1 Roll of 1" x2.5 yards tape, 1 eye wash solution 4 oz bottle, 1 Needi Diposable Penlight. 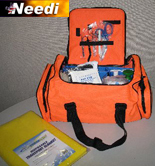 Large Emt kit made of 600 denier cordura with PVC coating. The fabric is water and fire resistant with life time warranty. Top lid had star of life screen printed and has zippered flip top. 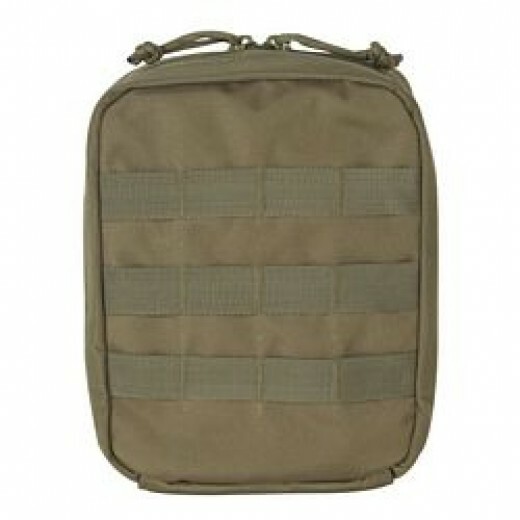 Inside 11 velcro detachable compartments for quick and easy access to medical supplies. Size: 19" X 10 1/2" X8" Kit consists of: 1 Adult Bag Valve mask, 6 nitrile latex free gloves, 10 4"x4" gauze sponges, 1 Bite Stick, 20 2"x2" gauze sponges, 1 mylar emergency blanket, 1 instant cold pack, 1 instant heat pack, 1 roll of coflex- med flexible hand tear bandage, 5 4" conforming stretch roll gauze, 5 3" sterile conforming stretch gauze roll, 5 2" sterile conforming stretch gauze roll, 1 pair of Truama Shears 7 1/2", 1 4" elastic bandage, 1 2" elastic bandage, 1 Needi Jumbo Triangular Bandage 40" with two safety pins, 5 5"x9" abdominal pads, 5 8x10 abd pads, 1 OPA KIT (set of 8 pcs), 1 Needi BP Cuff adult, 1 dual head sprague stethoscope latex free ,20 anti septic hand wipes, 1 Finger ring cutter, 1 Kelly hemostat 5.5" straight, 1 Needi Diposable penlight with pupil gauge, 1 roll of 1" clear adhesive tape, 1 face mask with eye shield, 5 knuckle flexible bandages, 16 1"x3" plastic adhesive bandage strips, 1 Trauma dressing 10"x30" sterile, 10 2"x3 (xlarge) plastic adhesive strips, 100 alcohol preps & 5 medium sized red bio haz bags.